I love lots of thing about Seoul. Some things I genuinely love and other things are just plain hilarious/ridiculous, so that is why I love them. Korean news and newspapers are loved because of their crazy articles, bad writing and overall bizarre nature. Here is my favorite recent article from the Korea Herald. While attempting to address the recent concerns about electricity shortages around the city the newspaper finds a way to include a quote from the President of South Korea. This would be great if the article wasn't about how how the President started to wear underwear so he wouldn't have to turn his heater on. 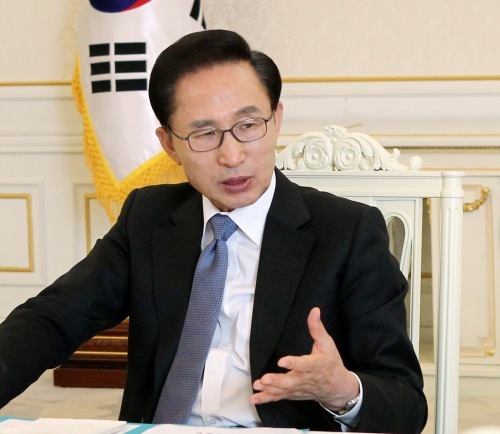 Lee’s remarks come on the heels of the government’s push to stabilize power supplies for this winter in efforts to forestall the recurrence of blackouts that swept across the nation in mid-September amid an unseasonable heat wave. The Ministry of Knowledge Economy unveiled a set of measures early this month, including a 10 percent demand cut for large manufacturers and caps on maximum temperatures for commercial buildings and the use of neon signs. Still, the ministry is wrestling to keep its reserves above the safety threshold of 4 million kilowatts, forecasting demand spirals between the second and third weeks of January. “The government has been doing its best to boost supplies through power plant construction and other schemes. It’s still a formidable task to keep up with skyrocketing demand,” Lee said, adding that Korea’s electricity consumption is increasing at a much faster clip than that for economic growth. In mid-January this year, power failure broke out at the country’s largest petrochemical complex in Yeosu, South Jeolla Province, as demand shot up to a record high of 73.14 million kilowatts. Though the blackout went on for up to 23 minutes, some factories could not resume operations for at least 10 hours, incurring more than 70 billion won ($60.7 million) in combined losses for 26 companies including GS Caltex Co., Korea’s No. 2 refiner. In the case of September’s brownouts, the peak demand was 67.26 million kilowatts. Nearly 9,000 individuals and businesses filed damage claims worth 61 billion won collectively. To drum up public participation, the ministry said it would launch power-saving campaigns nationwide and send alerts via television networks, social networking services and text messages if the reserves breach the bottom line. It also launched a website (www.powersave.or.kr) on Monday to provide citizens with energy-saving tips and demand and supply levels in real time. Citing Japan’s electricity-saving efforts following a nuclear crisis early this year and Korea’s gold collection drive at the height of the 1997 Asian financial crisis, Lee called for voluntary and active involvement.